I am a Midwest-born-and-raised, currently California-based multidisciplinary artist. I make daily illustrated stories in ink and watercolor, and I am an adventurer, traveler, and visual journalist. My life started out on a much more conventional path, as I marched through school and collected degrees that were supposed to bring me security and comfort. Instead of asking, "What will I get out of it? ", I started asking, "Who will I become as a result of this?". This question has guided each of the important and difficult decisions I have made over the years, to give both power and time to my creative work. Since 2009, I have done the work of discovering a creative practice I can do daily, with joy and consistency. In the process, I have invested my own savings, used credit cards, worked retail, taught classes, and been supported by family and clients, doing everything imaginable to keep alive this clear calling to create my own art. My daily art-making started in earnest in 2014, with my acceptance into an exhibition featuring 50 small artworks created in 50 days. You can see the blog of that process here. These days, I am into ink and watercolor sketches and illustrations with words and images woven together. I am interested in a long-term project of creating a nonfiction book of all illustrated text and images, in the re-emerging genre of painted stories or visual journalism. I create a one-page daily illustrated journal, called "Before 10am". I have been doing this every day since July 2016, and sharing it on Instagram, Twitter, and with my Facebook friends. 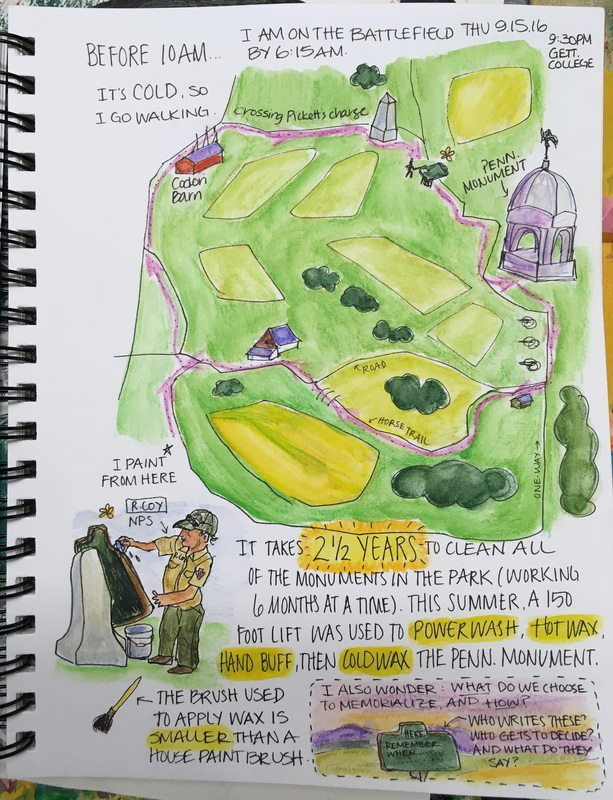 My fascination with public land conservation and travel have led me to create sketches as I journeyed through the Southwestern United States, as a volunteer at Yosemite National Park, and most recently, at Gettysburg National Park and surrounding Civil War battlefield sites. I have made my art available for viewing on Instagram as well as on my website, Wild Tomato Arts. I'm inviting you to join the Patreon community of modern-day arts patrons (if you haven't already), and become a patron of my art journey! You can help me continue my daily art making and help make possible my future long-term projects, like more books and exhibitions! Your support will also help me by providing some breathing space as I identify collaboration partners like literary agents, publishers, and more exhibition spaces to help distribute my work to wider audiences. With Patreon, you can be an angel investor in my development as an artist. Think of it as a virtual "high five", a way to encourage me and tell me to keep going. Every contribution makes a difference to me! More than a "Like" or a follow, your vote of support on Patreon demonstrates your belief in my creative process and the benefits you receive from my sharing. Your support will make a huge difference in my life, by helping me bring my work into the world. - Create and install a solo exhibition of 18 to 20 pieces at Bamboo hair + body, a Half Moon Bay hair salon/art gallery space, February 2017 DONE - actually it was 31 pieces! - Complete and self-publish an illustrated children's book by May 2017 - eek! instead of a children's book, I completed and self-published the Badass Women Portraits book! 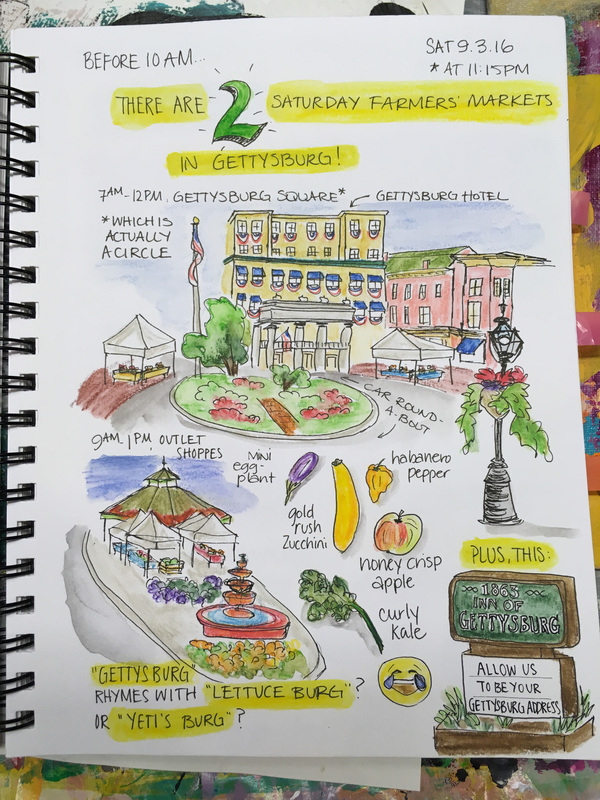 - Return to Gettysburg for exhibit, talk, workshop, and book release in 2017-2018 - DONE! I am on a journey to create art that offers both insight and delight, inspiring stewardship of the beauty in our world. Beauty can mean anything from noticing the details in a seemingly mundane moment of daily life, celebrating the story and significance of a single object, or basking in the unnameable grace of a sweeping landscape. I create as a way to connect to human experience, and to remind us of the power of our own unique way of seeing the world. Patreon is a global community of artists and their patrons -- that means people like you and me. Through this site, you can make a monthly donation in support of my ongoing work, and discover other independent artists and opportunities to support their ongoing work. Unlike project-based crowdfunding sites you may already know about (like Kickstarter), which are designed to raise large amounts of money for a single project, Patreon is designed to cultivate long-term patrons of artists' work, with monthly amounts to fit any budget. It's a way to pay people directly for their work. Work that you personally enjoy or benefit from in some way, or work you simply believe in. It's a way for you to vote with your dollars, at whatever level works for you. It's a virtual tip jar where you can symbolically high five, offer encouragement, and say to your favorite independent artist, "Keep going! I love you!". Arts patronage has existed throughout the centuries. But now, patronage is not limited to the few aristocrats and their tastes. It is wide open to the world to participate in. We're all in this together! From $1 to $100, every single patron makes a difference in my ability to continue creating and offering Wild Tomato Arts, wild and free. How much of my donation do you actually get? Patreon collects 5% of each donation, and PayPal collects 2% of each donation, capped at $1 per transaction. The rest goes to the artist (me). How committed are you as an artist? This is what I do. I have been, and will be, making the art anyway. I am very self-motivated, and reaching out to ask for support has been a stretch for me. Many of you have watched me start from scratch and teach myself art for the past three years. What I hope to create with this Patreon community is the foundation of support and time to complete my projects and reach wider audiences by pursuing partnerships, while continuing to grow and develop my skills. What if I want to give a one-time donation? Thank you! Any support is appreciated, and if Patreon is not for you, you can always make a one-time donation here. A big virtual high-five from me to you! THANK YOU for believing in me and my creative process. You get access to the patron-only feed here on Patreon. In addition to the patron-only feed, you will get one hand-written thank you card from me during each year of your patronage. In addition to the patron-only feed and thank you card from me, you can choose one 8"x10" print per year from the images released for patrons. Shipping outside USA extra. Hooray! It's working! Once I reach this first goal, I will scan and post all the "Before 10am" pages here, for all patrons. This also happens to be the amount by which our monthly rent will increase in 2017. It would be amazing to cover this incremental cost via Patreon!